We have such a great evening at our twilight SAS on Saturday. This card was made by Sally Williams. 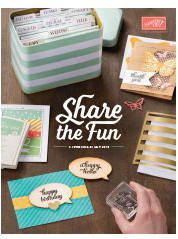 Using the Sale-a-Bration Stamp set Patterned Occasions & the Petite Pair sentiment set. The Paper Doilies on pg 5 of the Seasonal catalogue was a big hit too. These look so much better in real life. Sally used the fancy Fan embossing folder and the Window Frames collection die set. I'll post the second card on Wednesday.